The head medicine spirit of this vine is Papa Tua, a grandfather spirit. 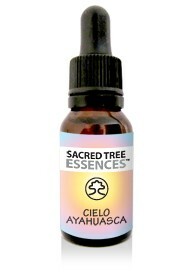 The essence is made using Cielo (Heaven) Ayahuasca, which has the ability to create spiritual ascension. It is used for cleansing and purification, opening the way to change and new beginnings. The colour of this essence's energetic medicine is multi-coloured, representing the plant's ability to work through the entire energetic system and etheric layers. On occasion, we are in need of an energetic cleanse, a spring clean and some spiritual guidance. In traditional Amazonian shamanism it is thought that our energy becomes crossed and that it needs to be periodically straightened out to maintain good spiritual health. We can sometimes get off track and adopt wrong thinking because we have moved away from divine truth and into negative and fearful thinking. Connect with Papa tua ‘your father’ the head medicine spirit of the ayahuasca vine for spiritual learning and guidance. Cielo ayahuasca is used to cleanse all the layers of the energetic body to help cleanse accumulated energy that needs to be released. 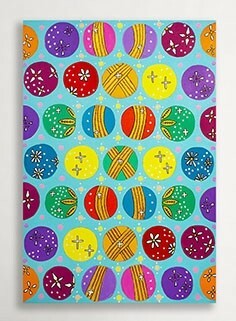 The colour associated with this essence is multicoloured symbolising its ability to work on all levels. This particular strain of ayahuasca is called cielo ‘heavens’ ayahuasca as has the ability to ascend the psyche out of the dark and into the light. When purification takes place a shift of consciousness occurs allowing you to see yourself and your world in a new light, opening the way to change and new beginnings. Each essence has been prepared with its own medicine song, an icaro. 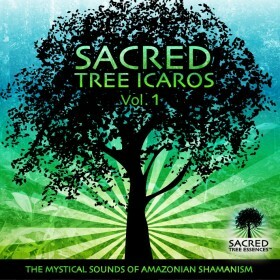 Icaros are a form of communication between the shaman and the spirit world. The icaro is used to set the healing intention and to ask the tree for assistance. 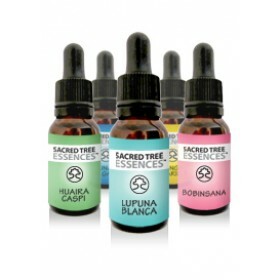 Each essence has been uniquely created by choosing certain qualities of each tree and calling forth its medicine with the icaro. The thrid image is of my painting 'Cielo Ayahuasca Vine Medicine'. Please note that this essence has been prepared using the ayahuasca vine only. The effects are not the same as drinking an ayahuasca brew/tea. They have been prepared in a way that is similar to homeopathic medicine, contain NO DMT and are completly legal. This vine grows up to the tree top canopy. It has the ability to climb up neighbouring trees and create a network of vines. 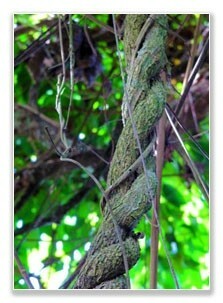 It is common for the vines to intertwine and form a helix shape. A small section of the vine can be cut and replanted from which a new vine will emerge. There are several types of ayahuasca. This particular type is called cielo ayahuasca and translates from Spanish as heaven’s ayahuasca. Traditionally this vine is mixed with the leaves of the Chakruna plant to form an ayahuasca brew. This brew is used by shamans in the Amazon for healing purposes. A ceremony is conducted in which the participant drinks the brew to cleanse their energetic body. It can induce vomiting and this purging enables unwanted energies to be released from the body. The Chakruna leaves are added to the brew to open psychic vision. There are several plants which are known as teacher/power plants that can be added to the ayahuasca brew. They are added for their spiritual healing and teaching abilities. In Quechua, ayahuasca translates as the vine of the soul. The Cielo Ayahuasca Essence made me more creative and more present. It also helped a lot against hot flushes and changes in mood caused by menopause. Furthermore I feel that it removed my light winter depression caused by the lack of light. This is an amazing products. Combined with breathing work and Music (icarus cd is lovely), I feel the same guidance (whisper) as during the ayahuasca ceremonies I had. Very subtle aha-moments, answers and insights popping up in my head. I really love this essence very much. I already ordered again! The day before i started using the Essence, i said a prayer from my heart asking for the help of the Grandfather spirits of the Amazon to help me through the process and to guide me. I was Planning to do a small detox alongside using the essence, and the Tree spirits came to me in the middle of the night, very powerfully telling me that it is best for me to eat normally. Since then i have had strong moments and subtle moments. Lots of Guidance on certain days, and being able to feel different energies more clearly. I feel a really strong connection with the Tree spirits, and now I feel my life path completely altering, and going down a much more holistic route. a little bit of the jungle in the comfort of your home! Mimi's essences are amazing! I use them for various purposes. Sometimes I do a formal dieta for a full week or two, sometimes just for a few days to help me connect, sometimes just a single use in the morning or night if I'm feeling like I need a little help. I really liked having the Cielo Ayahuasca to reconnect with the experiences I've had in the Amazon. I love the Ah-ha moments this essence brings. Just like a shamanic dieta! I have some experience of shamanic dieting in the Amazon jungle with the medicine trees there. When I took the Cielo Ayahuasca essence I was surprised to find that I had a very similar experience - I found that initially I was feeling quite emotional, as the essence brought up sadness and anger in order for me to purge them. After a few days this settled down and I felt light, clear and more energised. I took the essence for 2 weeks - for much of the first week it was moving blocked energies within me and during the second I got to reap the benefits of this, feeling better than I had for some time. Mimi has tremendous shamanic abilities which are put directly into these essences and combined with the medicine spirits can produce wonderful effects. These essences really work!